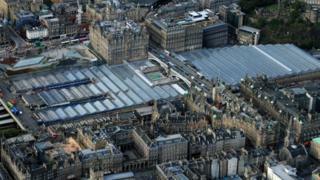 Network Rail is to begin consultation on a long-term development plan for Waverley Station in Edinburgh. Passenger numbers at the station are expected to double to more than 49 million by 2048. The Waverley Masterplan will be led by a partnership of Network Rail and City of Edinburgh Council. A key element is likely to be a mezzanine floor above existing platforms to create more space for passengers. The plan's backers believe the station in its current form will be unable to cope with projected passenger volumes. Rail passengers and the Edinburgh public will be asked for their views, with the final plan being published in September. Work at Waverley is expected to be phased over 30 years and it is hoped the station will be fully functioning and accessible to all throughout the development. Norrie Courts, director of stations for Network Rail, outlined the key problems with the station's current set up. He identified connectivity, accessibility - especially from the Old Town, Waverley Bridge and Princes Street - and the fact that the station "doesn't have much presence". Mr Courts told the BBC's Good Morning Scotland programme passengers "want easy access to the station, they want good connectivity, they want good wayfinding, they want clean toilets, they want WiFi." He said the project would try to minimise disruption to passengers and keep the station operational, safe and secure. Lesley Macinnes, transport committee convener of the council said the station was "pivotal" to the city's public transport offering. She added: "With a rapidly increasing population and ever more visitors coming to the capital, it's necessary that we rethink the way we approach transport. In the face of such pressures we need to facilitate rail travel as a reliable and efficient choice for commuters - as well as residents and visitors."